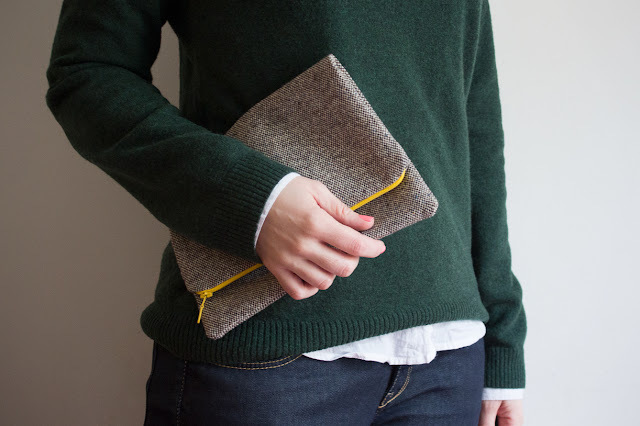 This is my new tweed clutch. I made it myself. From a pair of pants. Seriously. 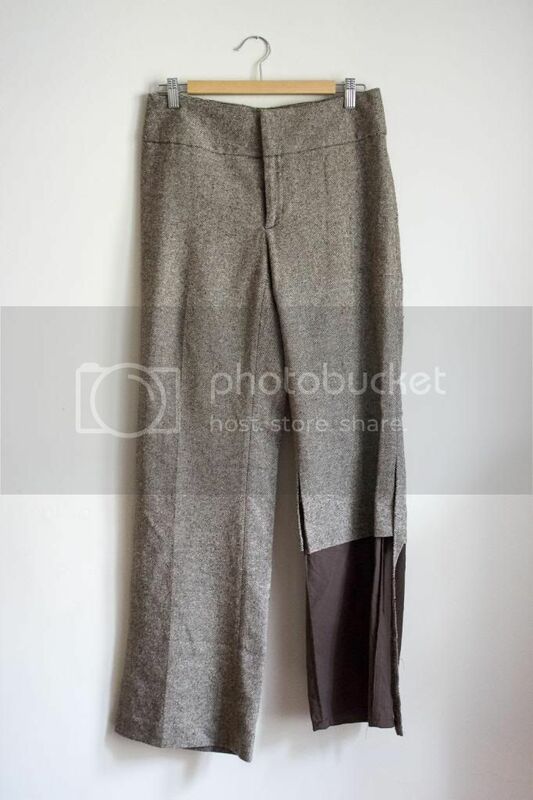 I had these wide leg tweed pants from Banana Republic that I hadn't worn in years, and rather than just throw them out or give them away, I decided to recycle. 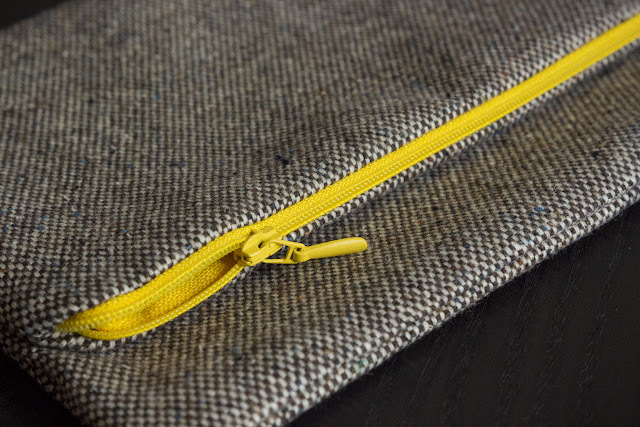 I followed this wonderful tutorial from Say Yes to Hoboken, and in just a few hours I had this fabulous fold-over clutch. I still don't know quite what to do with it, but I am sort of in love. And then best part is I still have another pant leg to cannibalize! Oh and did I mention? The pants were part of a suit. 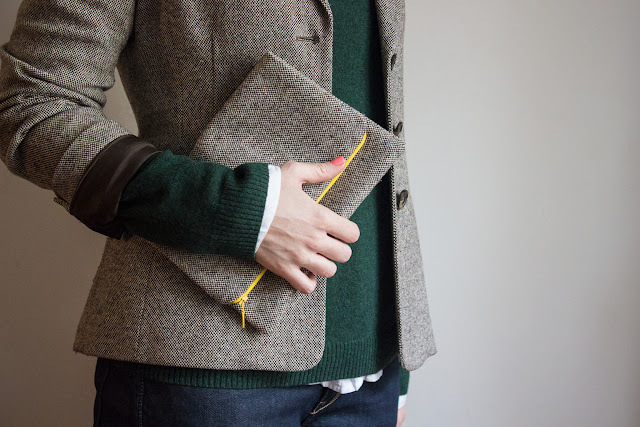 So now, even though I'd have thought it would be the last thing I would ever want, I have a blazer with a matching clutch. Somehow the pop of yellow makes it totally ok in my book. Do you repurpose your old clothing? If it's a heavier fabric, I highly recommend trying this out! Labels: bags, banana republic, Cos, DIY, fashion, H+M, jackets, Oysho, photos by d.
Ooh, you just gave me ideas for my little pile of scrap fabrics. Sewing machine, here I come. Great job, that clutch is really cute! Thanks! I'm really happy both with how quick and easy it was, and how well it turned out. Let us know if you start whipping things up out of your scraps! Is your Cos jumper current? I ask as it looks a lot like one I saw when I was in the London store last November but they didn't have my size and I'm still thinking about it. These things are sent to haunt you aren't they? Your own purse business? I'm impressed! I'm not a very experienced sewer either, and to be honest, this is my first solo zipper, but it was super easy. I think what really makes it so simple is that she starts with the zipper first, before any other sides are sewn shut, so if anything goes slightly off you can always adjust it after your zipper's in place. Give it a try, I bet you'll have no problems. I've updated the link in the post as well in case anyone else is curious. I absolutely love it and wore it nonstop through the winter. Lightweight but still warm, and those elbow patches are a detail I just couldn't resist. Go get one! i love the colour of the zipper with the strictness of the fabric. great combination and i'm really sorry in advance if i plagiarize (is this a word?) your idea. And am still trying to figure out when/why/where to use it. But I think this pouch will eventually prove to be useful somehow, even if just to organize other items in a bigger bag... Regardless of the utility factor, I am pretty much in love with it! I recently came across your blog and have been reading along. I thought I would leave my first comment. I don't understand what to state except that I've enjoyed reading. Nice blog. I could keep visiting this blog very often.